We associate spring with spending more time outdoors, sunshine, the occasional rain shower, and of course, colorful flowers. Spring is the perfect time to add a splash of color to your garden while performing regular maintenance. Blooms Landcare has some easy to follow tips on maintaining your garden this season. If you need help maintaining your garden this spring, give us a call and let us assist you. Leaves, sticks, and other debris may find its way into your garden during the winter. Before planting new flowers, do a thorough clean out of your garden. Keeping the amount of dead foliage to a minimum will help prevent mold, keep pests at bay, and promotes plant health. After winter, you may need to add nutrients to your soil to keep your plants healthy all spring and summer. Use nutrient-rich topsoil, fertilizer, or add minerals and nutrients using a supplement like Osmocote. Some flowers may look great but could not do well with the amount of sunlight you have in a particular area of your garden. 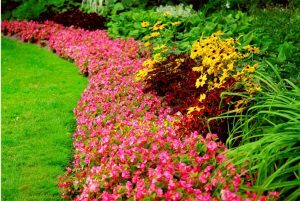 Think about how you are going to organize your garden and speak to a professional landscape designer in how to implement more colorful plants so that it can thrive. Slugs are a big problem in the Fort Worth area. The good news is that you can prevent these slippery sleuths from getting ahold of your colorful plants. When you plant your new flowers, place copper wire around the base of the plant. Slugs and snails are repelled by the copper and will leave your flowers alone. If you have questions about garden maintenance this spring, talk to one of our experienced landscape designers at Blooms Landcare today. Call (817) 688-5352. We are happy to assist you in getting a more colorful garden.